One thing my mom was insisting on eating during this trip was Chili Crab. It was non-negotiable so we decided to try a restaurant recommended both by Lonely Planet Singapore and by tourist brochures issued by the Singapore Tourism Board, No Signboard Seafood. Named such because they become popular without having a signboard, (“It’s that stall with no signboard.”) it’s quite ironic that they have a gigantor, neon signboard now. We started our meal with a simple vegetable soup. Light and appetizing, this vegetable and seaweed laden soup was a sign of good things to come. Seafood was on our agenda that evening, so, perhaps to compensate for all the feasting to follow, we had to have vegetables. 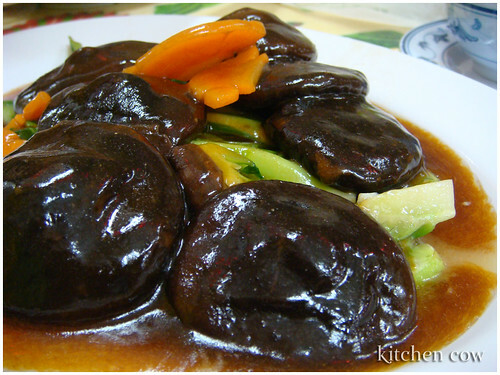 We chose a plate of mushrooms with seasonal vegetables, cooked in oyster sauce. This is one vegetable dish that can hold its own against the other dishes. The meaty shiitake mushrooms were so steeped in flavor you forget you’re eating veggies. To fill our meat quota, we had some pork spare ribs. 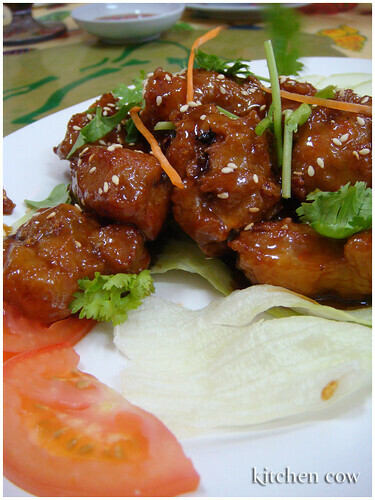 Cooked in a sweet-salty sauce, the pork was very tender and fell from the bone with the slightest tug. It looks cloyingly sweet but biting into it changed my opinion. The combination of sweet and salty was just right, with no heavy seasoning to kill your tastebuds. “The Cereal Prawn here is really good,” our friend Tappy recommended. So, of course we had to order. She was so right. 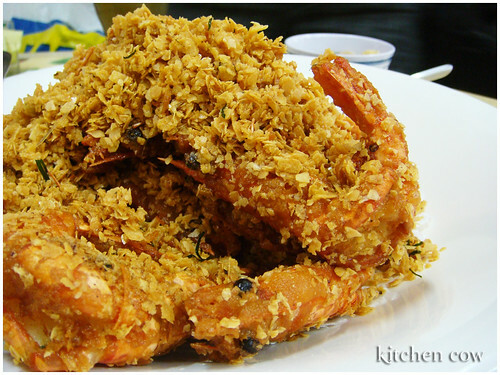 Imagine, large, succulent, buttery tiger prawns, crusted in cereal that was reminiscent of oatmeal (heck, it’s probably oatmeal :P), then fried to a crisp. So sinful, so good. The restaurant had the foresight to provide us with small bowls of lemon water. You had to have clean hands because you’ll want to lick your fingers. Moments later, we were given a large platter holding a gigantic crab that weighed close to a kilogram. Cooked in white peppercorns, spring onions, garlic and whatever secret ingredient, it had the characteristic slow-spreading heat that you get from peppers. The strong peppery flavor, coupled with the firm, fresh, slightly sweet crab flesh was perfect. Oh Pepper Crab, how we love you so. Lastly came a deep dish filled with an orange colored sauce that we can only describe as evil. 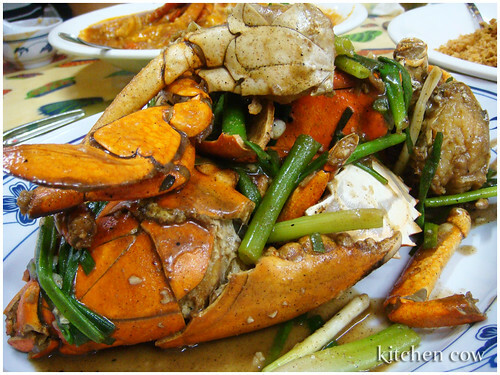 The star of our evening, the Chilli Crab was rich, thick, and spicy. 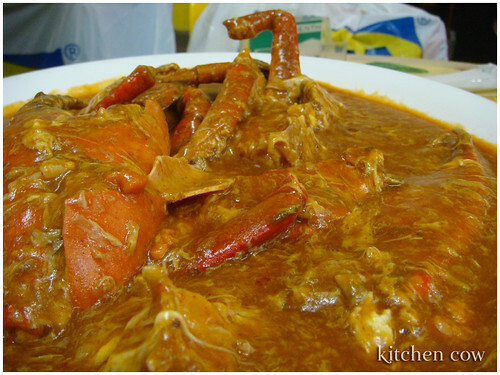 The fiery, flavorful sauce was addictive; a perfect complement to the fresh, slightly sweet crab meat. Traditionally, you sop up the sauce with mantou, the Chinese bread used for buns like siopao but being Filipino, we opted to enjoy our Chilli Crab with copious amounts of rice. To wash it down, we had glass after glass of the wonderfully refreshing water chestnut, a lightly sweetened drink mixed with finely chopped water chestnuts. It reminded me of gulaman, only lighter and more refreshing. 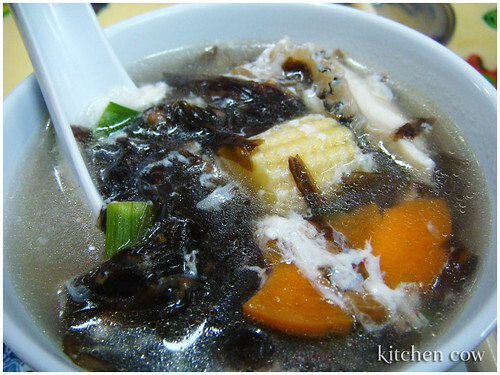 Water chestnut is available in a lot of Singapore food places but the best one we had was at No Signboard.